This article is about a dietary therapy for epilepsy. For information on ketogenic diets as a lifestyle choice or for weight loss, see Low-carbohydrate diet. Possible therapeutic uses for the ketogenic diet have been studied for many additional neurological disorders, some of which include: Alzheimer's disease, amyotrophic lateral sclerosis, autism, brain cancer, headache, neurotrauma, pain, Parkinson's disease, and sleep disorders. By 2007, the ketogenic diet was available from around 75 centres in 45 countries, and less restrictive variants, such as the modified Atkins diet, were in use, particularly among older children and adults. 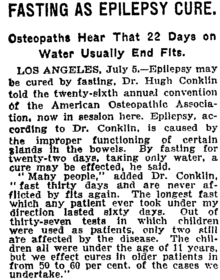 The ketogenic diet was also under investigation for the treatment of a wide variety of disorders other than epilepsy. A systematic review in 2018 looked at 16 studies on the ketogenic diet in adults. It concluded that the treatment was becoming more popular for that group of patients, that the efficacy in adults was similar to children, the side effects relatively mild. However, many patients gave up with the diet, for various reasons, and the quality of evidence was inferior to studies on children. Health issues include high levels of low-density lipoprotein, high total cholesterol, and weight loss. Experts on the ketogenic diet recommend it be strongly considered for children with uncontrolled epilepsy who have tried and failed two or three anticonvulsant drugs; most children who start the ketogenic diet have failed at least three times this number. 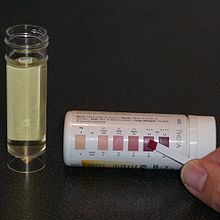 Hypocitraturia: the urine has an abnormally low concentration of citrate, which normally helps to dissolve free calcium. The urine has a low pH, which stops uric acid from dissolving, leading to crystals that act as a nidus for calcium stone formation. Many institutions traditionally restricted the water intake of patients on the diet to 80% of normal daily needs; this practice is no longer encouraged. In adolescent and adults, common side effects reported include weight loss, constipation, dyslipidemia, and in women, dysmenorrhea. At the initial consultation, patients are screened for conditions that may contraindicate the diet. A dietary history is obtained and the parameters of the diet selected: the ketogenic ratio of fat to combined protein and carbohydrate, the calorie requirements and the fluid intake. The ketogenic diet has been studied for potential therapeutic use in various neurological disorders other than epilepsy: Alzheimer's disease (AD), amyotrophic lateral sclerosis (ALS), autism, headache, neurotrauma, pain, Parkinson's disease (PD) and sleep disorders. The evidence of benefit for these conditions has not reached the level where clinical recommendations can be made. 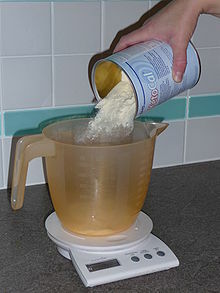 ^ In this article, kcal stands for calories as a unit of measure (4.1868 kJ), and calories stands for "energy" from food. ^ Unless otherwise stated, the term fasting in this article refers to going without food while maintaining calorie-free fluid intake. ^ Hippocrates, On the Sacred Disease, ch. 18; vol. 6. ^ Hippocrates, Epidemics, VII, 46; vol. 5. ^ Galen, De venae sect. adv. Erasistrateos Romae degentes, c. 8; vol. 11. ^ Galen, De victu attenuante, c. 1. ^ A good reduction is defined here to mean a 50–90% decrease in seizure frequency. An excellent reduction is a 90–99% decrease. ^ a b Gano LB, Patel M, Rho JM. Ketogenic diets, mitochondria, and neurological diseases. J Lipid Res. 2014 Nov;55(11):2211-28. doi:10.1194/jlr.R048975. PMID 24847102. ^ a b c d e Stafstrom CE. An introduction to seizures and epilepsy. In: Stafstrom CE, Rho JM, editors. Epilepsy and the ketogenic diet. Totowa: Humana Press; 2004. ISBN 1-58829-295-9. ^ a b c d e f g h i Wheless JW. History and origin of the ketogenic diet (PDF). In: Stafstrom CE, Rho JM, editors. Epilepsy and the ketogenic diet. Totowa: Humana Press; 2004. ISBN 1-58829-295-9. ^ Temkin O. The falling sickness: a history of epilepsy from the Greeks to the beginnings of modern neurology. 2nd ed. Baltimore: Johns Hopkins University Press; 1971. p. 33, 57, 66, 67, 71, 78. ISBN 0-8018-4849-0. ^ Guelpa G, Marie A. La lutte contre l'epilepsie par la desintoxication et par la reeducation alimentaire. Rev Ther med-Chirurg. 1911; 78: 8–13. As cited by Bailey (2005). ^ Kossoff EH. Do ketogenic diets work for adults with epilepsy? Yes! epilepsy.com. 2007, March. Cited 24 October 2009. ^ Kossoff EH, Rho JM. Ketogenic diets: evidence for short- and long-term efficacy. Neurotherapeutics. 2009 Apr;6(2):406–14. doi:10.1016/j.nurt.2009.01.005 PMID 19332337. ^ Liu H, Yang Y, Wang Y, Tang H, Zhang F, Zhang Y, Zhao Y. Ketogenic diet for treatment of intractable epilepsy in adults: A meta-analysis of observational studies. Epilepsia Open. 2018 Feb 19;3(1):9–17. doi:10.1002/epi4.12098. PMID 29588983. ^ Bergqvist AGC. Indications and Contraindications of the Ketogenic diet. In: Stafstrom CE, Rho JM, editors. Epilepsy and the ketogenic diet. Totowa: Humana Press; 2004. p. 53–61. ISBN 1-58829-295-9. ^ a b Epilepsies: diagnosis and management. National Institute for Health and Care Excellence (NICE). Published January 2012. Updated February 2016. Cited March 2018. ISBN 978-1-4731-1790-7. ^ a b Scottish Intercollegiate Guidelines Network. Guideline 81, Diagnosis and management of epilepsies in children and young people. A national clinical guideline (PDF). Edinburgh: Royal College of Physicians; 2005. ISBN 1-899893-24-5. ^ a b c d e Turner Z, Kossoff EH. The ketogenic and Atkins diets: recipes for seizure control (PDF). Pract Gastroenterol. 2006 Jun;29(6):53, 56, 58, 61–2, 64. ^ Kossoff EH, McGrogan JR, Freeman JM. Benefits of an all-liquid ketogenic diet. Epilepsia. 2004 Sep;45(9):1163. doi:10.1111/j.0013-9580.2004.18504.x. PMID 15329084. ^ a b c d Kossoff EH, Freeman JM. The ketogenic diet—the physician's perspective. In: Stafstrom CE, Rho JM, editors. Epilepsy and the ketogenic diet. Totowa: Humana Press; 2004. p. 53–61. ISBN 1-58829-295-9. ^ Spendiff S. The diet that can treat epilepsy. Guardian. 2008 Aug 15;Sect. Health & wellbeing. ^ Wang D, Pascual JM, De Vivo D. Glucose Transporter Type 1 Deficiency Syndrome. In: Adam MP, Ardinger HH, Pagon RA, Wallace SE, Bean LJH, Stephens K, Amemiya A, editors. GeneReviews. Seattle (WA): University of Washington, Seattle; 1993–2018. 2002 Jul 30 [updated 2018 Mar 1]. PMID 20301603. ^ a b c d e Zupec-Kania B, Werner RR, Zupanc ML. Clinical Use of the Ketogenic Diet—The Dietitian's Role. In: Stafstrom CE, Rho JM, editors. Epilepsy and the ketogenic diet. Totowa: Humana Press; 2004. p. 63–81. ISBN 1-58829-295-9. ^ a b c Bergqvist AG. Long-term monitoring of the ketogenic diet: Do's and Don'ts. Epilepsy Res. 2011 Aug 18;100(3):261–6. doi:10.1016/j.eplepsyres.2011.05.020. PMID 21855296. ^ Vogelstein F. Epilepsy's Big, Fat Miracle. New York Times. 2010 Nov 17. ^ Musa-Veloso K, Cunnane SC. Measuring and interpreting ketosis and fatty acid profiles in patients on a high-fat ketogenic diet. In: Stafstrom CE, Rho JM, editors. Epilepsy and the ketogenic diet. Totowa: Humana Press; 2004. p. 129–41. ISBN 1-58829-295-9. ^ Pfeifer, Heidi H. Low glycemic index treatment. Epilepsy Foundation. 22 August 2013. Cited 31 March 2018. ^ KetoCal Product Information. Nutricia North America. Cited 8 June 2018. ^ KetoVOLVE: 4:1 Ratio Powder. Solace Nutrition. Cited 17 June 2013. ^ a b Kossoff EH. 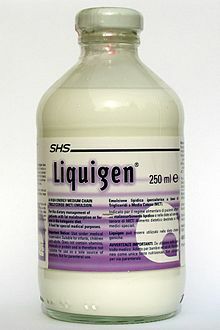 The Ketogenic Diet ... in a bottle?. Keto News. Epilepsy.com. Updated July 2009. Cited 29 November 2009. ^ a b Kossoff EH, McGrogan JR. Worldwide use of the ketogenic diet. Epilepsia. 2005 Feb;46(2):280–9. doi:10.1111/j.0013-9580.2005.42704.x. PMID 15679509. ^ Porta N, Vallée L, Lecointe C, Bouchaert E, Staels B, Bordet R, Auvin S. Fenofibrate, a peroxisome proliferator-activated receptor-alpha agonist, exerts anticonvulsive properties. Epilepsia. 2009 Apr;50(4):943–8. doi:10.1111/j.1528-1167.2008.01901.x. PMID 19054409. ^ Weber DD, Aminazdeh-Gohari S, Kofler B. Ketogenic diet in cancer therapy. Aging (Albany NY). 2018 Feb 11;10(2):164–165. doi:10.18632/aging.101382. PMID 29443693. Freeman JM, Kossoff EH, Freeman JB, Kelly MT. The Ketogenic Diet: A Treatment for Children and Others with Epilepsy. 4th ed. New York: Demos; 2007. ISBN 1-932603-18-2. Matthew's Friends. A UK charity and information resource. The Charlie Foundation. A US charity and information resource, set up by Jim Abrahams. epilepsy.com: Dietary Therapies & Ketogenic News. Information and regular research news updates. A Talk with John Freeman: Tending the Flame. An interview discussing the ketogenic diet that appeared in BrainWaves, Fall 2003, Volume 16, Number 2. Lurie Children's Hospital: How the Ketogenic Diet Works.